The north-western corner of today's France was known during the Roman period as Armorica. The tribe of the Veneti had been the most powerful of Armorica's tribes, and that name gradually changed during the Roman occupation to be applied to the territory itself as Vannetais. This was how Armorica was initially known to the Britons who began migrating there in the fourth century AD, during a period in which British town life appears to have declined. The low-key migration from Britain into Armorica seems to have picked up noticeably in the mid-fourth century, but it became a flood in the unsettled fifth century. Traditional certainly maintains that the British colony in Armorica was founded before the expedition of Constantine III in 407. People arrived mainly from the south-west of Britain, from Dumnonia and Cornubia, and each group retained its ethnic name (ergo the people in each region knew exactly what they were ethnically or tribally, regardless of who was king over them). This new colony of Britons formed in a region that was beginning to drift out of firm Roman control. The colony's traditional first king, Conan Meriadog, ruled Armorica as the kingdom of Vannetais, maintaining the local Belgic tribal name. The area was permanently 'freed' of Roman control by Magnus Maximus as the first stage of his invasion of Gaul in 383. Conan was placed in command, with a probable capital in Vannes. The usual Celtic practice of dividing territory between sons soon created the smaller principalities out of Vannetais during the course of the fifth and sixth centuries whilst other Britons also popped over from the mainland to found their own principalities. This was the easternmost of Armorica's British kingdoms. The precise circumstances surrounding its founding are shrouded in myth and half-remembered oral tradition, but it seem to have existed by the early decades of the sixth century. The Armorican territories of what came to be known as Brittany (literally 'Little Britain') began to be established during the Late Roman empire period thanks to unsettled conditions in Britain itself and the apparent weakness of Rome's central authority. The campaigns of Magnus Maximus (AD 383-388) and Constantine III (AD 407-411 onwards) in Europe appear to have contributed a great deal to setting up the Armorican colonies. Situated nearest the Frankish border and seemingly including Rennes within its territory, Bro Erech is shown alternatively as Broërec or Bro Ereg. It was the surviving portion of the Vannetais kingdom, after Cornouaille and Domnonia had become separate principalities in their own right. This shrunken Vannetais continued to bear that name until it was re-titled Bro Erech, the name deriving from Waroch (as Bro-Waroch - often touted as the founder of the principality), and this was first mentioned in the Lives of the Saints. It was also mentioned by Gregory of Tours, who located many of the events of his lifetime near Vannes, seemingly an important site in Vannetais and named after the former Veneti Celtic tribe of the area whose Romanised remnants were quickly absorbed by the new British arrivals. However, precisely which Waroch was responsible for renaming the kingdom is uncertain. There were two of them within the space of half a century, making any educated guess near impossible. All of the Armorican principalities were apparently the equivalent of sub-kingdoms, under the authority of the king of Brittany himself (see feature link, right, for a basic introduction to the kingdom of Brittany). St Brieuc in modern Brittany may be a survival of the Bro Erech name. The powerful Caradog Freichfras is king of Gwent in mid-South Wales, inheriting the throne through his father, Honorius Ynyr Gwent. Following his accession he sails across the Channel to found the kingdom of Bro Erech which forms the heartland of Vannetais and serves as its largest kingdom in terms of its territorial extent. King of Gwent. Founded the kingdom. The Kinoc of Geoffrey of Monmouth's History of the Kings of Britain is probably identifiable with a Kinoc who succeeds St Padarn or Paternus, a bishop of the British Church in Wales in the mid-fifth century. Padarn is recalled to Brittany by 'Prince Caradoc' (seemingly Caradog Freichfras), to become bishop of Vannes, and Kinoc replaces him in his position in Wales. Sometimes claimed as kingdom founder. Renamed it 'Bro Erech'. Son. Killed 3 brothers to hold kingdom. Macliau saved by St Felix. The Frankish duke, Chramn of Aquitaine has several times risen in rebellion against his father, Chlothar I, but during his final rebellion he has to flee to Brittany and the court of Canao. His father pursues him, defeats the combined forces of Chramn and Canao, and Chramn is strangled and placed in a cottage which is then burned down. Broth. Conomor Domnonia's friend. Killed by Tewdwr Cornouaille. Son. Not crowned. Killed by Tewdwr of Cornouaille. Macliau, ruler of Bro Erech, had previously entered into a reciprocal arrangement with Budic, king of the Bretons, whereby the two kings had promised each other that whichever monarch outlived the other would take care of his son. Upon Budic's death, Macliau had forced Budic's son, Tewdwr, to flee the kingdom. Tewdwr now returns to kill both Macliau and his eldest son Jacob. Second son of Macliau. Allowed by Tewdwr to reign. Chilperic, king of the Franks, sends an army to fight Waroch along the Vilaine. The Frankish army consists of units from Anjou, Bayeux, Maine, Poitou, and Touraine. The Baiocassenses, the 'men from Bayeux', are Saxons. They in particular are routed by the Bretons over the course of three days of fighting. Waroch is forced to submit in the end, and pays homage by sending his son as a hostage and agreeing to pay an annual tribute. He subsequently breaks the latter promise, but Chilperic's dominion over the Bretons (or at least their eastern borders) is relatively secure as evidenced by Venantius Fortunatus' celebration of it in a poem. Gunthchramn of Burgundy compels Waroch to renew his oath in writing and demands a thousand solidi in compensation for raiding Nantes. That compensation has not been paid by 588, even though Waroch has promised it both to Gunthchramn and Chlothar II of the Franks. In 589 or 590, Gunthchramn sends an expedition against Waroch under the command of Beppolem and Ebrachain. Ebrachain is an enemy of Fredegund, queen consort to the late King Chilperic, and it is she who sends the Saxons of Bayeux to aid Waroch. Beppolem fights Waroch alone for three days before dying, at which point Waroch attempts to flee to the Channel Islands. Ebrachain destroys his ships and forces him to accept renewed peace, the renewal of his oath, and surrendering a nephew as a hostage. Despite all of this, the Bretons retain their spirit of independence and refuse to be cowed by the powerful Franks. Upon the death of Gregory of Tours in 594, no more information on Bro Erech is available. It seems likely that the principality is united with Domnonia under Judicaël, whose great-grandmother seems to have been Triphine, daughter of Waroch. Bro Erech is likely to be Judicaël's inheritance after the death of Canao II. However, Bro Erech's land seems to be divided at some point, and for a time may not even be under Brittany's control. The Frankish 'Breton March' at Nantes has been designed to contain the Bretons, with Rennes and Vannes included in this borderland. It is only with Brittany's resurgence in the ninth century that these areas are regained fully by the Bretons. It appears to be this period in which the southern part of Bro Erech around Vannes and its northern part around Rennes both gain their own separate lines of counts. As the former heart of Bro Erech, Vannes is shown here as an eventual continuance, whilst Rennes is shown separately. The kingdom of Vannetais had been founded in Armorica by British émigrés during the fourth and fifth centuries AD. As the kingdom became better known as Brittany ('Little Britain') thanks to its British dominance, the name Vannetais seems to have remained attached to the land itself, or at least areas of it. The name still seems to have been in use for the more nebulous eastern territories that bordered the Franks, but was eventually changed or evolved into Bro Erech. This remained a petty kingdom within Brittany until the seventh century, when it was seemingly inherited by the king of Brittany itself. At some point after that Bro Erech's territory appears to have been divided. Its southern part around Vannes and its northern part around Rennes both had their own separate lines of counts by the ninth century. The two sections were anyway divided by heavily forested highlands and were sparsely populated. The division appears to be due to the Frankish creation of a 'Breton March' or borderland, which was designed to keep the Bretons contained within Armorica and prevent their expansion eastwards. In the ninth century this failed, with much of this territory along with Nantes (on occasion) being reclaimed by the Bretons, principally by Nominoë. 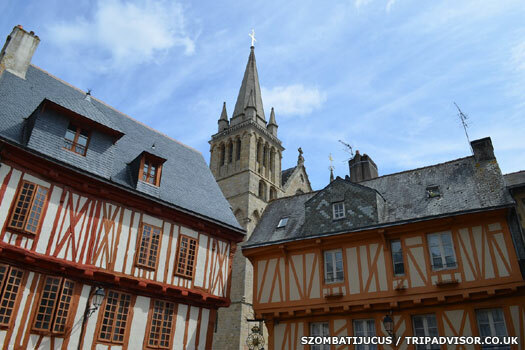 Charlemagne had already established Vannes as a county around 799, when Frodoald, who came from a relatively obscure Austrasian noble family, was appointed count here. Frodoald's brother, Guy, was similarly position in Nantes. As the former heart of Bro Erech, Vannes is shown here as a diminished eventual continuance, whilst Rennes - arguably the more powerful of the two in later years - is shown separately. According to an Angevin genealogy of the eleventh century, the House of Rennes was descended in the male line from the House of Vannes, showing a likelihood that Rennes was a division of Vannes, and not the other way around. The name is the same, simply changed over time due to language shifts. However, the origins of Vannes in its earliest form seem less clear. 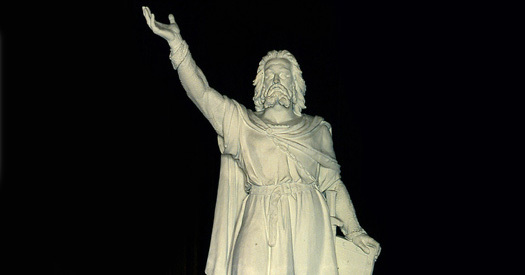 Caradog Freichfras was king of Gwent in mid-South Wales, and he is credited (in near-legendary terms) with sailing to Armorica to found the kingdom of Vannetais in the late fifth century. More probably he assumed command of an existing British settlement, if he came at all. The name Gwened is used as a source for the earliest form of the name Vannes. This would seem to be a re-usage of Gwynedd in North Wales, and this is usually claimed to be the case. Given the traditional involvement of Caradog Freichfras, however, it would seem more likely that the name was based on 'Gwent', or 'Guenta' in its earlier post-Roman form. The trouble is that finding a language shift to account for Gwent or Guened/Guenta becoming Vannes (or Rennes) raises a severe problem. The usual progression in ethnic P-Celtic areas is from Latin 'v' (ie the 'w' sound) to 'gw' (pronounced goow or gwoo). There's no plausible reverse shift to take a name from Veneti ('weneti') to Guened (or Gwent, which is even more doubtful) to Vannes. Another example that includes an initial 'g' being dropped does not come to mind, but in names (many in Gaul) where the 'w' sound was not replaced by a 'gw' sound, these indeed did progress to a 'v' sound. So while the shift from Guened to Vannes seems highly unlikely, the possibility does exist. 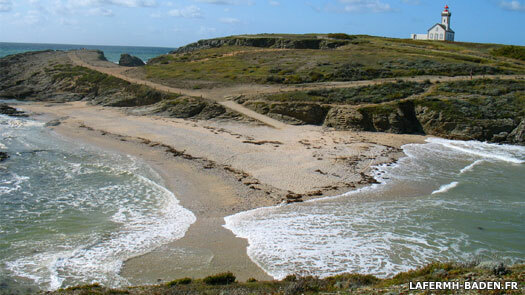 The county of Penthièvre belonged to the House of Vannes from at least the eleventh century. One man linked to Penthièvre - if not the actual count - was Raoul, briefly king of Brittany in 922-923. An Austrasian. First (Frankish) count of Vannes. King Louis the Pious (Louis-le-Pieux), of the Frankish empire, sends Abbot Witchar to negotiate with King Morvan of Brittany, which fails. Louis assembles an army in the spring of 818 at Vannes, within the 'Breton March' which at this point is controlled by the Franks. With Lambert of Nantes in support, he launches a series of attacks against various Breton fortresses and, after Morvan is killed in battle, resistance collapses. The Chronicle of Moissac records Louis returning with a 'triumph of victory', although the Bretons revolt again in 822 under Wiomarch. In order to put a stop to various Breton rebellions, Louis the Pious now appoints Nominoë as the first duke of Brittany and chief of the Vannetais. Placing Nominoë as first duke of Brittany in 824 appears to contradict the entries for Wiomarch and Lowenen until 837, but referring to him as chief of the Vannetais suggests that he becomes the first native count of Vannes at this time. There seems to be no evidence either way to prove or disapprove this, unfortunately, other than two charters that confirm his position in Vannes but not when it is assumed. Count of Vannes (& Poher?). First duke of Brittany? With the accession of Charles the Bald (Charles-le-Chauve) to the throne of West Francia, Nominoë has been acting entirely independently as the rightful king of the Bretons. Charles sends an army to quell this upstart but it is defeated at Ballon, near Redon (845). The ambitious Nominoë, count of Vannes, does not settle for only one victory. Instead he boldly goes on to conquer Rennes and Nantes (with the help and support of Lambert of Nantes), as well as the provinces of Maine and Anjou. Breton territory has by now spread into Frankish lands where the Breton language is not spoken. It is from these victories that the history of the dukes of Brittany really begins. In order to gain even more freedom. Nominoë snatches Brittany from the authority of the archdiocese of Tours. Instead he founds the archdiocese of Dol in order to establish a self-governing Breton church which can continue to support the traditions of the Bretons. Nominoë's successors as duke of Brittany, from Erispoë to Alain Barbetorte, vigorously apply themselves to the protection of the duchy's independence from the Franks and Norsemen. Under the control of Duke Salaün (857-874), Brittany is even expanded as far as the Cotentin and Laval. It seems to be during this period that full Breton control over Vannes, Rennes, and Nantes is restored, consigning the former Frankish 'Breton March' to history. Son. Duke of Brittany. Also count of Vannes (& Poher?)? Murdered. Count of Vannes/Gwened (& Poher?). Prominent landowner. Ninth century Brittany is a very civilised place in which peasant property rights are enshrined in law and the powers of the prince (king or duke) are strictly limited. This is all undone when when Salaun is assassinated and the land overrun by Vikings. Breton rule is eventually restored under Alain the Great, but in the meantime, Gurvand rules in Rennes and Pascweten in Vannes, and both are claimants to the throne. Pascweten is Salaun's son-in-law and also one of his assassins, along with Gurvand, and Wigo son of Rivelen of Cornouialle (and possibly also Poher). Neither Gurvand or Pascweten are powerful enough to assume complete control so they fight it out amongst themselves for two years, and divide the country until both are dead. Pascweten's brother Alain continues the fight from Vannes against Judicaël of Rennes until the latter is killed when both team up to fight the Vikings. Alain now controls Brittany unopposed, although his numbering doesn't seem to account for two earlier Alains. Son. Brother of Alain I of Brittany. Son and possible count of Rennes. Predeceased his father. The death of Alain the Great, son of Ridoredh, results in instability in the land. Gourmaëlon, count of Kernev, seizes power and declares himself 'Prince of Brittany'. Ownership of Vannes is unclear at this time but Rudalt seems to be the count until he is forced to flee by the Vikings. Alain's son-in-law, Mathuedoï, would seem to succeed him as count of Poher at the same time. In Nantes the name of the current count seems to be unknown, although it is likely that he is a Frankish appointee. The Loire Vikings invade, slaying King Gourmaëlon in battle and occupying Brittany. They establish their main naval base at the mouth of the Loire (at the southern edge of Brittany's lands), laying waste to Nantes, and then they use Brittany as a springboard for attacks on the Western Franks and the English (possibly in support of their kin in East Anglia). It is possible that the Bretons also lose control of Vannes at this time. It is hard to say whether there is a sitting count of Vannes, although there do seem to be viable candidates for the position. Mathuedoï, count of Poher is married to the daughter of the late Alain the Great, and his son, Alan, is the godson of Edward the Elder, king of Wessex and all the English. 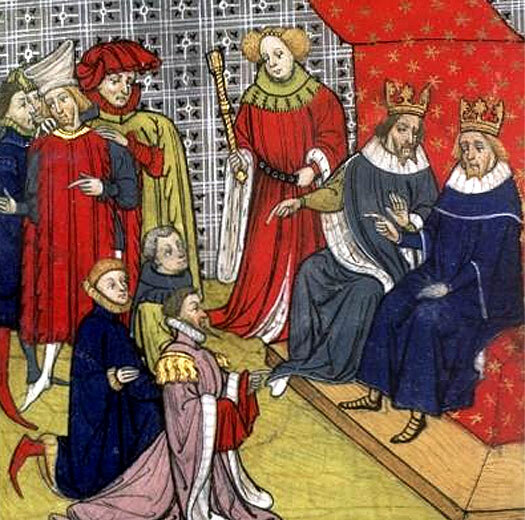 Mathuedoï puts to sea with a great multitude of Bretons and travels to meet Edward: 'this king had great trust in him because of this friendship and the alliance of this baptism'. Brought up from infancy with Æthelstan (Edward's eldest son), 'Alan is strong in body and very courageous, and does not care to kill wild boars and bears in the forest with an iron weapon, but instead uses a wooden staff'. Brother-in-law. 'Count of Poher'. m daughter of Alain I. Having already encouraged a failed Breton rebellion against the Vikings, the monk Yann de Landévennec now calls on Alain to return to Brittany, which he does in 936 with the blessing and support of Æthelstan of Wessex. Meanwhile, the future Hugh the Great of Aquitaine is organising the return of Louis IV to West Francia. Alain's campaign against the Loire Vikings is successful and he is declared Duke Alain II. Then he allies himself with his cousin, Judicael of Nantes (called 'Berenger' by the Franks) and Count Hugh II of Maine to attack the Seine Vikings (the Normans). The presence of a powerful cousin in Nantes who bears a distinctive Late Romano-British/Breton name would strongly signal that this town is still part of Brittany. Son. Count of Poher. Duke of Vannes & Nantes, and Brittany. Son. Prince of Brittany. Last count of Vannes? Brittany appears to be ruled by the counts of Nantes at this time, probably Hoël or Guerech of Nantes. The numbering for Hoels as dukes would suggest that this particular Hoel is not involved (although this does not help in Guerech's case). 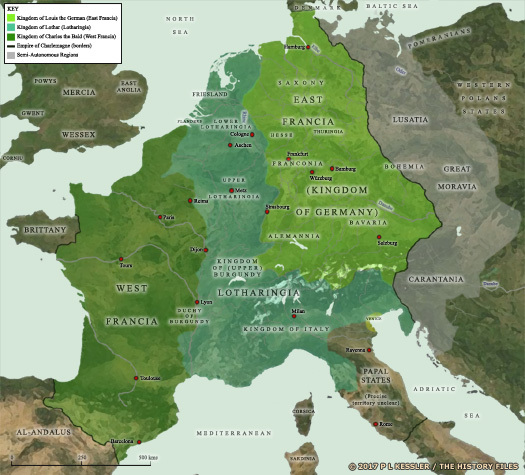 After 990 the duchy is certainly ruled by the counts of Rennes upon the accession of Conan I, and until 1066. By this time, West Francia has finally suppressed a weakened Brittany, and the kings assume the title of 'Duke of Brittany' (and already appear to have done so earlier in this century). Even so, they maintain much of their independence until 1532. The county of Vannes seems to be terminated following the death of Drogo - or at least no longer has its own counts. Given that it still remains within Brittany the answer could be that it is drawn directly under the authority of the duke of Brittany himself, which position is now being fulfilled by the counts of Rennes. The important city of Nantes had until the reign of Alain II been joined to Vannes as a single county, but had been divided when Drogo had gained Vannes. An alternative possibility is that Vannes and Nantes are reunified following Drogo's death, now under their control.